What is it about forged irons that inspires such spiritual devotion in serious golfers? It’s true that they tend to be prettier – shinier – than your average cast club. A well-made forged iron, in the eyes of an enthusiast, is something akin to an exquisite piece of jewelry. But looks aren’t everything – even to a devoted player. There has to be more. And in the case of some clubs, there most definitely is. 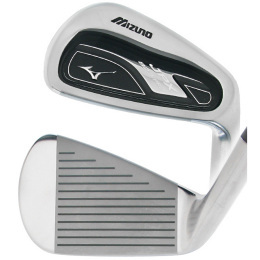 One company that has consistently set the standard for forged irons is Mizuno. If you’ve ever hit a forged Mizuno, you know that there’s a decided difference in the feel, sound and consistency of their clubs – especially when compared to your average cast irons. Where does that difference come from? It’s a matter of the metal that’s used to make the clubhead – and the process by which that metal is turned from a rod of molten 1025 steel into the oh-so-sweet 6-iron that feels just like true love when you strike it right. And there’s the small matter of a patent, too. Mizuno was founded in 1906 as a sporting goods company. At first, its niche was baseballs and athletic wear. But by 1933, Mizuno was making golf clubs, the first Japanese company to do so. Since then, Mizuno has gone on to become one of the favorite clubmakers of professionals and amateurs alike. Seve Ballesteros played them. Nick Faldo played them. Luke Donald ascended (and recently re-ascended) to his World Number One ranking playing Mizuno irons. Even Tiger Woods was a Mizuno man once upon a time. Tiger played Mizunos during college and continued to use them after he turned pro, despite being under contract with Titleist. In fact, during his first Masters win in 1997, the irons in Tiger’s bag were forged Mizunos. And I’d wager that a lot more pros would have played Mizunos over the past 40-odd years if they hadn’t been bribed by other club manufacturers to endorse their brands instead. As Masao Nagai, Mizuno’s Director of Global R&D explains, forged clubs like the ones Mizuno makes are made very differently than cast irons. Cast irons are made by pouring a ‘liquid’ metal (usually an alloy comprised primarily of stainless steel) into a mold, letting it cool, then breaking the mold and finishing the clubhead. It’s been compared to making ice cubes. One of the downsides of casting with stainless steel alloys is that when the metal is poured into the mold, it invariably traps small bubbles inside – just as you’ll find in ice cubes. That’s one of the reasons why cast irons tend to have a different sound than forged clubs when they strike a ball. That air that’s trapped inside dampens the sound vibration. It can also create inconsistencies in the playing surface of the club. 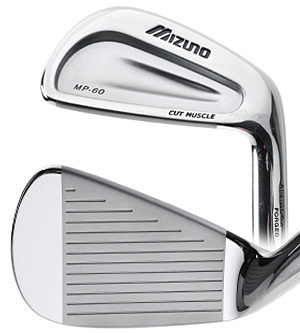 Cast alloys also don’t have the ‘grain flow’ found in Mizuno’s forged clubheads. With cast clubs, the grain in the metal gets randomized in the casting process, something that would be heresy to Mizuno’s way of looking at things. You could try to make a cast iron with a mild carbon stainless steel like the kind Mizuno uses, but the high viscosity of that sort of steel means that it wouldn’t take to the molding process well. Manufacturers would have a hard time making sure the molds were entirely filled with such a material. You could also try to use a stronger stainless steel, like a 17-4 stainless for example, and that would have some benefits. The 17-4 stainless is very strong – twice as strong as the mild carbon steel used to make Mizunos and other forged irons – so you could in theory design clubs with thinner cavity backs. But the hardness of this kind of steel makes it difficult to work with. It will crack or break easily when hammered. And it wouldn’t offer the feel that a softer steel, one made with less carbon, imparts. Another downside of the casting process in general is that it’s not conducive to creating consistently flat surfaces. When you turn liquids into solids, there’s always some degree of shrinkage – and the casting of clubheads is no exception. It may be minor – or even within so-called tolerances – but it’s there. When the metal cools, it invariably deforms. Cast clubs are also more prone to warping during manufacturing. Because the thickness of the iron’s head decreases from bottom to top, the sole cools more slowly than the top of the clubface; when the top of the club has already become solid, the bottom is still cooling. This can promulgate a pulling or stressing of the metal, which in turn can lead to warping. There are, of course, many excellent cast clubs – including some made by Mizuno. And for your average amateur, the differences may not be that immediately noticeable. There are even some PGA pros who play cast irons (although they are very carefully made and inspected before being put into tournament use). But most of the game’s better players will tell you that the consistency and feedback of a forged club makes a real difference. And many of them will go on to tell you that there’s something extra special about the feel of a Mizuno iron. Where does this special feel come from? It starts with the metal itself. To make a Mizuno iron, the company begins with a 10-inch billet of 1025e “Pure Select” steel that has been made for Mizuno at the renowned Chuoc forging house – the same Hiroshima-area supplier that Mizuno has been working with to produce superior steel for decades. Mizuno is the only club manufacturer that Chuoc creates this special steel for. The “1025” means that there is 0.25% carbon in the steel, the optimal amount in Mizuno’s opinion to provide workability, durability, strength and feel without brittleness. The “Pure Select” designation denotes that the forging process has been further optimized to reduce the presence of unwanted elements in the steel, including such nasties as phosphorus and sulphur. So there’s a material difference between Mizunos and other forged irons. 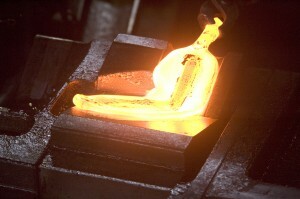 But Mizuno then takes the science of forged clubmaking a step farther with its patented ‘Grain-Flow’ forging process. Just like a piece of wood, steel has a grain – a natural flow in the fibers that make up the material. And as in wood, the grain acts to strengthen the material and to give it more consistency and durability. In Mizuno’s clubs, this grain flow is maintained all the way through the finished head – from the top of the hosel to the toe. Think of it as using the ‘whole grain.’ Unlike other manufacturers, who mill and grind the heads with little or no attention paid to grain – or those who weld their hosels to their faces – Mizuno irons are crafted from one piece of steel that has the grain running all the way from one edge to the other – “like a baseball bat,” said Llewellyn. This ‘grain-flow’ process has been patented by Mizuno, and if you ask players who swear by Mizunos why they love them so much, chances are they will point to the feel and consistency that this process results in. 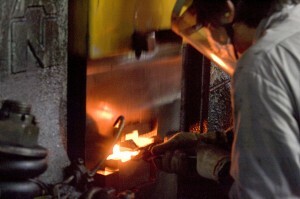 This Mizuno forging story isn’t just a tale of better clubs that are only for better players. The technology Mizuno is using has allowed the company to expand its use of the grain-flow forged materials and processes into designs that are in fact game-improvement clubs – like its JPX 800 Pro irons. It costs two-to-three times more to create forged clubheads the way Mizuno does than it costs to manufacture your average cast clubhead. But for many players, including Mizuno staff pro Luke Donald, it’s worth it. The site also features Donald in a series of short, gospel-music-themed videos entitled “The Gospel According to Luke,” where Donald underscores the importance of iron play to scoring. The campy music takes the campaign concept a step too far in my opinion, but there’s no doubt that Donald is the perfect poster boy for the message. There’s a lot of truth to what the campaign says. Because while you may use your oversized (if not over-hyped) driver 14 times in the course of a round, you’ll be reaching for your irons a lot more. And how often you have to reach for them may depend, in part, on what kind of irons you’re reaching for. So if you haven’t hit a Mizuno forged iron recently, you just might be doing yourself a favor by trying one out this season. There’s a reason why they get so many gold awards in golf magazine club tests: they perform. You may not hear angels sing every time you swing one of them, but Mizuno goes to great lengths to make them something special. And that’s the gospel truth.